This was an irresistible drink conceit to end my contribution to Sussex Week on. I initially toyed with the idea of working up a variation on a 40s classic cocktail to celebrate the book but as a child the overriding memory of Brighton I have is walking away, decaying my teeth slowly on a minty stick of rock. 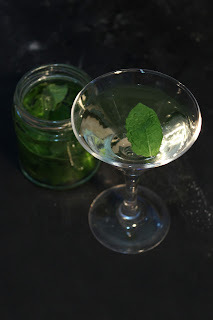 That said, rather than take the easy route of popping out and buying a bottle of Crème De Menthe to play with, I decided to pursue an adult twist on the flavour of mint and what could be more adult than infused spirits. So bottle of gin in one hand and fresh mint in the other, I set about making a Brighton Rock. The fundamental principles of infusion open up a wealth of possibilities for experimentation. In this case I took Hendricks (an already cucumber strong gin) and let a packet of mint steep in it for two days, but the beauty of the method is that its just as simple to experiment with a multitude of combinations.